When I first embarked on my project of helping unemployed ministers and students in the Philippines 8 years ago, I didn’t have any idea that I would need around $50,000 per month to send for monthly salaries and school aid for over 400 adopted ministers and dozens of theology students. And often, our funds are low. Each night I’d talk with God about it, and relied on His rescue in every situation. I had to step out in faith since there’s not much else I could do. Each month I would send checks to the Philippines even when there is no money in the bank. There was a time when we checked our bank account online and we only had $6,000 and any day the 17 checks amounting to $40,000 were due to arrive for clearing. That night I lay awake talking to God about it. The next morning a $10,000 check came in the mail. And smaller checks came, too, the following days. How did those people know I needed money? Three months later, we were again short on funds, so I talked with God until 5:00 in the morning. At noon, the same donor sent another $10,000. And as always, God makes sure there is enough money to cover the checks that I write. Today, I don’t want to check how much money we have in the bank anymore. I have to believe that God is in charge of this organization. Who is George Mueller? So, I decided to do some research on the man and I’m very fascinated with his story and have learned a lot from him. Never ask any human being for help, however great the need might be, but to make his wants known to God who has promised to care for His servants and to hear their prayers. Do not receive any fixed salary, because in the collecting of it there was often much that was at variance with the freewill offering with which God’s service is to be maintained, and in receiving of it, a danger of placing more dependence on human sources than in the living God. Take this command (in Luke 12:33) literally. ‘Sell that thou hast and give alms,’ and never save up money, but to spend all God entrusted to him on God’s poor, on the work of His kingdom. Take Romans 8:8, ‘Owe no man anything’ literally, and never to buy on credit, or be in debt for anything, but trust God to provide. 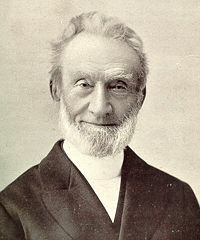 In 1832 George Mueller moved to Bristol, England to be the pastor of Bethesda Chapel Church. His work with orphans began when two young children were left at the church to be cared for. At that time Mueller only had two shillings to his name. During a time of need, there would always seem to be funds available from some source, both in regards to their private income, and to the funds for his orphanage. George Mueller lived by the rule that “no emergency is unforeseen and no want unprovided for by God.” Imagine Mueller’s thankfulness—but lack of surprise—when a milkman who was making his daily deliveries broke a wheel on his cart in front of the orphanage. The milkman knocked on the door and asked if he could give the orphans his supply of milk! Upon his death in March 1898 at age 92, God had sent more than $7,200,000 to supply for his needs. New orphanages and buildings were built and purchased, staff was hired, and hundreds of children never missed a meal. Many times prayers were said over empty plates at the dinner table only to have food arrive at the last moment. During his life, Mueller started 117 schools, which educated over 120,000 young people and orphans. No matter how pressing the need, George simply renewed his prayers, and either money or food always came in time to save the situation. In his lifetime Mueller read the Bible through over 200 times and half of these times on his knees. Over 3,000 of his orphans were won to Jesus Christ through his ministry. In his lifetime, George Mueller’s faithfulness to seek God witnessed 50,000 specific answers to prayer and requests from God!